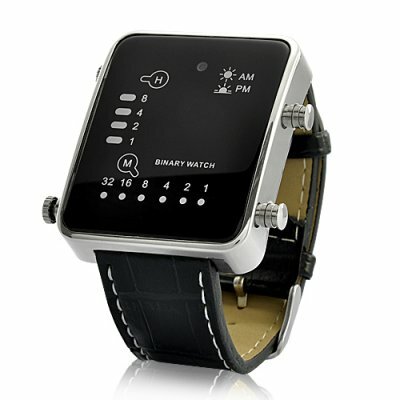 Successfully Added Singularity - Japanese Style Binary LED Watch with Hidden Camera (4GB) to your Shopping Cart. Introducing the Singularity Japanese Style Multicolor LED Watch with Hidden Camera. Cool and geeky meets convert and cunning in our first LED Watch. With so many colors, labels, and holes, would you even know if one of them was staring you in the face and secretly recording video? Well that's exactly what the Singularity Japanese Style Multicolor LED Watch with Hidden Camera is doing. It looks and functions just like the original CVIZ-G86 Singularity LED Watch, but has been upgraded to contain a hidden lens able to record 640 x 480 video at 30FPS, or take 1600 x 1200 picture snapshots. 4GB internal flash memory is also included so you don't have to worry about capturing too much video. Similar to the popular Singularity LED Watch, the Singularity is also able to tell time... if you know how to read it. Tap the display button on the right side of the timepiece and watch the screen light up. In Time mode, the vertical column represents hour information in binary code. The horizontal row represents minute information also in binary code. In Date mode, the vertical column represents the month, and the horizontal row represents the day of the month, in binary code. Our first LED Watch is here and coming out in style. Be the first to stock your online store with these unique watches and lock in some amazing profits before anyone else. Order today and we'll express ship them out tomorrow. Brought to you by the leader in direct from China wholesale electronics - Chinavasion. Reading Binary Code: Binary numerals are read from right to left. Starting from the most right position and moving leftward, each binary place value corresponds to the decimal number, namely 1, 2, 4, 8, 16, 32 and so on. There are only two binary numerals: 0 and 1. Binary 0 means you don't add the decimal place value. Binary 1 means you do add the decimal place value to your running count. As such if you wanted to represent the decimal number 10 in binary, you would write 1010 (There is a binary digit of 1 in the "2" and "8" decimal number positions. Therefore, the sum of "2" and "8" is "10"). If this is difficult to understand, Wikipedia is also a good resource for understanding binary numbers.